You are the network administrator for a company which wants to set up a GRE tunnel to a remote office. Both networks are locally configured, and need only the tunnel configured. Step 1: Ping RA from RB. a. Use the show ip interface brief command on RA to determine the IP address of the S0/0/0 port. b. From RB ping the IP S0/0/0 address of RA. Step 2: Ping PCA from PCB. Attempt to ping the IP address of PCA from PCB. We will repeat this test after configuring the GRE tunnel. What were the ping results? Why? The pings failed because there is no route to the destination. Step 1: Configure the Tunnel 0 interface of RA. a. Enter into the configuration mode for RA Tunnel 0.
b. Set the IP address as indicated in the Addressing Table. c. Set the source and destination for the endpoints of Tunnel 0.
d. Configure Tunnel 0 to convey IP traffic over GRE. e. The Tunnel 0 interface should already be active. In the event that it is not, treat it like any other interface. Step 2: Configure the Tunnel 0 interface of RB. Repeat Steps 1a – e with RB. Be sure to change the IP addressing as appropriate. 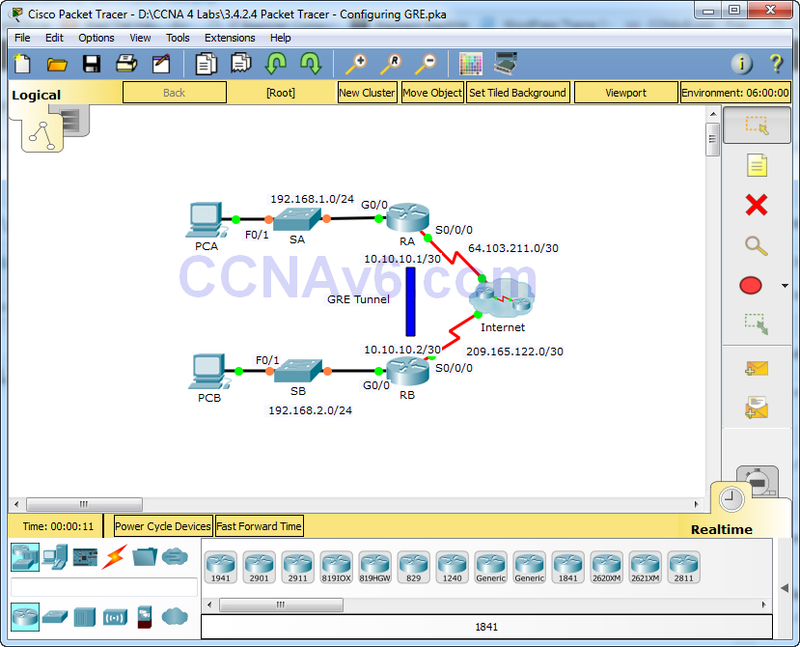 Step 3: Configure a route for private IP traffic. Establish a route between the 192.168.X.X networks using the 10.10.10.0/30 network as the destination. Step 1: Ping PCA from PCB. Attempt to ping the IP address of PCA from PCB. The ping should be successful. Step 2: Trace the path from PCA to PCB. Attempt to trace the path from PCA to PCB. Note the lack of public IP addresses in the output.